Teeth whitening has become so popular that it seems like everyone is doing it. If you want to obtain a bright and white smile, teeth whitening may be just what you are looking for. Not only is teeth whitening effective, it can also drastically change your smile and improve your self-esteem at the same time. The peroxide ingredient in most teeth whitening products is what actually bleaches the enamel and makes your teeth whiter. The strength of the whitening treatment typically depends on the strength of the peroxide contained in the whitening product. The current percentages of peroxide in teeth whitening products are 10%, 16%, and 22%. If your dentist has determined that you are a candidate to have your teeth whitened, you will need to decide which teeth whitening method to choose from. In-Office Bleaching — In-office teeth whitening offers excellent results. This procedure is performed in the dental office and can be done quickly, usually in a little over an hour. In-office bleaching is expensive, but the time that you save by having immediate results can make this option appealing. Teeth Whitening Trays and Gels — Teeth whitening trays and gels are effective, but the desired results take longer to achieve than with in-office bleaching. Depending on the strength of peroxide in the gel, these clear trays are usually worn a couple of hours a day or overnight and could take anywhere from 3 days to a couple of weeks before any results are noticed. There are basically two types of teeth whitening trays and gels: Those purchased from your dentist and those purchased over the counter. While they will both whiten your teeth, the two have noted differences.Teeth whitening kits from the dentist produce faster and more effective results because they contain a stronger peroxide bleaching agent than whitening kits purchased over the counter. Another benefit of trays and gels from the dentist is that the trays are custom made and fit your teeth exactly. Over-the-counter trays are generic sized and could allow the bleaching agent to come into contact with your gums, causing irritation. Teeth Whitening Strips — Teeth whitening strips are popping up in every drug store across the nation. These whitening strips sold over the counter are fairly inexpensive, easy to use and most of them really work. Teeth whitening strips may take longer to produce the desired results depending on the strength of peroxide that they contain. Good Housekeeping did an interesting study about which whitening strips work the best. Teeth Whitening Toothpastes — Teeth whitening toothpaste contain mild abrasives to remove surface stains. Some whitening toothpaste may have additional polishing agents and special chemicals that are more effective against stains than regular toothpaste, but teeth whitening toothpaste are not designed to actually "bleach" your teeth. Other Teeth Whitening Products — New teeth whitening products are always popping up including whitening chewing gum, dental floss, and mouthwashes. While these products are relatively new, not much research has been done to prove or disprove the effectiveness of these whitening products. I have actually tried all three and I am sad to say that while they tasted good or worked well, I didn’t see any whitening results. 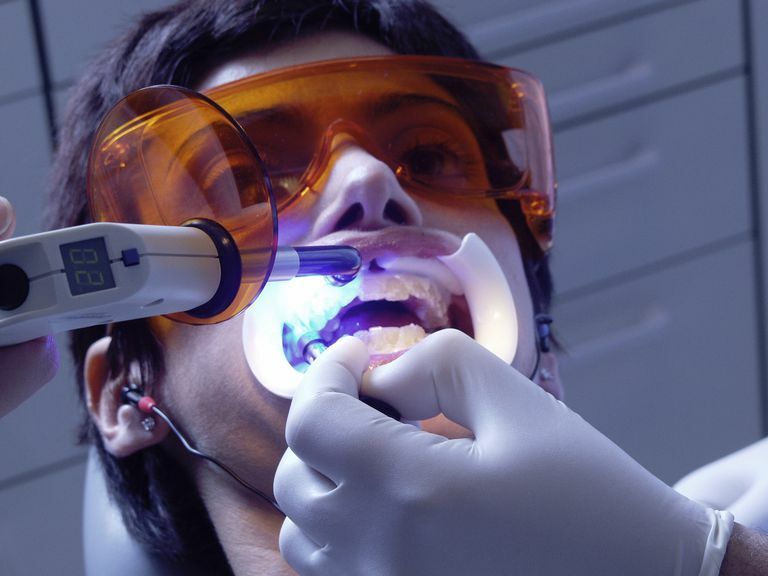 If you are still unsure, ask your dentist to recommend a teeth whitening treatment for you. If you live in the United States, be sure to look for the American Dental Association (ADA) seal of acceptance on over-the-counter teeth whitening products. "Tooth Whitening Treatments," American Dental Association. 18 September 2007.